With the spread of print and Protestantism dethroning old sources of certainty, sixteenth-century Germany was ripe for revolution, writes Alexander Ecob in Eye 82. The technical nature of the book, replete with numerical tables of observations and scientific terminology, made its main contents impenetrable to ordinary readers. The introduction was more accessible, but the plainest explanation of the paradigm-shifting theory came from an elegant half-page diagram. Representing the six known planets enclosed within a sphere of fixed stars, the Sun sitting motionless at its centre, the diagram condensed pages of figures and tables into little more than a few circles of ink. Its austerity and precision echo the Euclidean geometric diagrams on which Copernicus’s calculations were based, and emphasise the scientific foundation of the work: there is no decoration or glamour, as was common in celestial diagrams of the time, just a straightforward statement of facts, the definitive expression of the data. 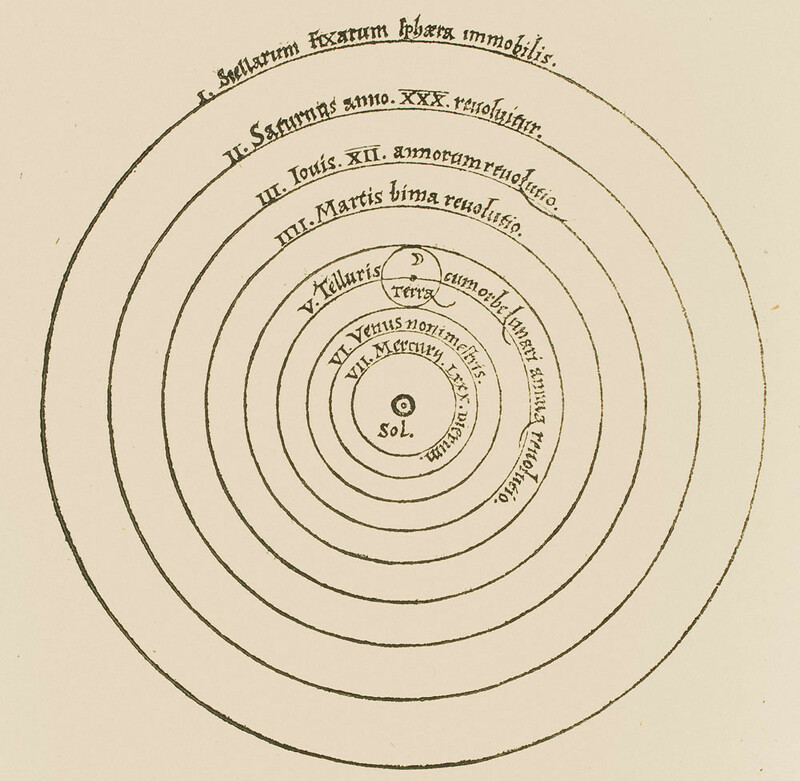 The success of De revolutionibus itself may have been overstated – Copernicus posited problematic circular, rather than elliptical, orbits, and it was not until posthumous revisions of his theory were made (by Kepler, Galileo and Tycho) that heliocentrism became the consensus among scientists. But the image of the heliocentric universe has become an icon of scientific endeavour and rational thought; without it, and the scientific revolution it initiated, the world we live in today could have been a very different place.